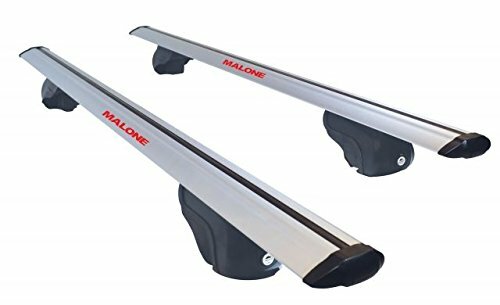 Malone AirFlow2 Universal Cross Rail Roof Rack - The AirFlow2 Universal Cross Rail Roof Rack by Malone features enhanced strength, improved fit capability and upgraded aerodynamics. All new for 2017, it includes integrated towers, pre-installed locks and double walled aluminum rails for a quiet and confident ride. The sleek aero style rails are made of non-corrosive aluminum double wall construction that delivers a secure transport for your rooftop gear and have a 165 lb maximum load capacity. They are aerodynamically designed to deliver a smooth quite ride in all conditions and have a Lifetime Warranty to ensure years of service. The next time you're ready to hit the road for some outdoor fun, make sure you have the Malone AirFlow2 Universal Cross Rail Roof Rack.